As I’ve done twice before, I’ve posted the title page for the next chapter. Yes, that means Chapter I ended with page 52, and Chapter II will begin next week. 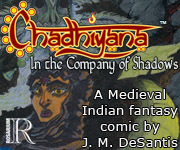 I know for many of you weekly readers this comes as a disappointment, but as I’ve written in the past, though I am publishing Chadhiyana: In the Company of Shadows as a web-comic, the book was written as a single, two part graphic novel. I want to create a sense of that, even in this weekly posting format, but there are other reasons for it as well. First, it’s necessary for me to get a little break between chapters. With the break, I have the opportunity to get further ahead on pages for the book (build a better lead) or to catch up on other freelance work for which I’m responsible. Second, I hope it adds to the effect of the cliffhanger ending and makes you even more excited for the next page. So, I do have reasons for including the chapter title pages. It’s not laziness on my part–not at all. That said, with Chapter I ended, the plot really begins to pick up (in case that isn’t evident by now). I’d been waiting to get to that last scene of Chapter I for a long time now, and I’m happy with how it came out; I’d written it over a year ago now. However, as I keep saying this is only the beginning. 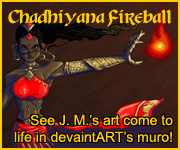 I never like to give too much away, but I think I’ve already written at least once that you can expect a more of Chadhiyana in Chapter II, and, of course, you’ll find out what happens next. It’s all very exciting for me to be telling this story, and I’m glad so many people are enjoying the book. Also, a sincere thanks to everyone who stopped by my Artist Alley table at this past weekend’s Boston Comic Con 2014, and for everyone who came out to the Self-Publishing in Independent Comics panel on Friday. I’ll likely write a fuller, detailed thanks and response to the con on my blog tomorrow (on jmdesantis.com), but I wanted to at least take the opportunity to do so today on this site as well. Well, that’s all folks. I’ll be back next week with page one of Chapter II! Stay tuned and keep reading. There’s so much more to come.